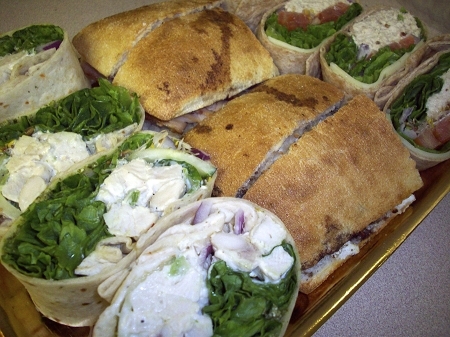 11"X8" Gold board tray with clear dome lid filled with sandwiches of your choice. 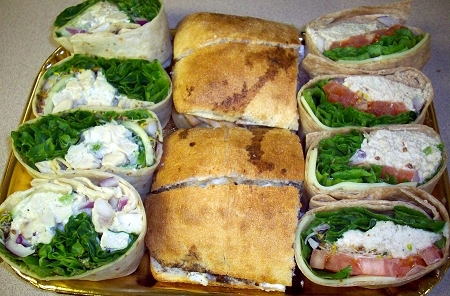 Sandwiches are made fresh to order, many are steamed or panini grilled, then cut into 1/4 to display on the platter. The clear dome lid keeps them fresh for transport and is stackable. Two bags of assorted chips and a small container of pickles are supplied with this tray. For pick up or local delivery only. Turkey, spinach and artichoke spread, artichoke hearts, tomato and swiss cheese on ciabatta. Tuna, lettuce, tomato, onion, sprouts and swiss cheese in a wheat wrap. Lettuce, tomato, roasted red peppers, red onion, sprouts, cucumbers, hummus and sesame ginger dressing in an herb wrap. Basil Focaccia, mozzarella, roasted red peppers, red onion, tomato, sprouts, hummus, balsalmic vinegar and basil pesto. Rosemary focaccia, avocado, basil pesto, roasted red peppers, red onion, tomato and Swiss cheese. Chicken salad, lettuce, red onion, cucumber, sprouts, and pesto.